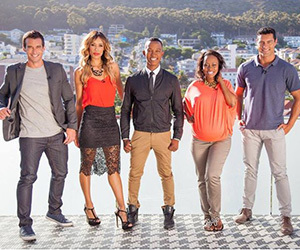 Expresso is a South African morning show broadcast LIVE from a penthouse apartment in Sea Point, which has panoramic views of Table Mountain and the ocean. Expresso showcases lifestyle entertainment, including kids' entertainment and green awareness, on-trend fashion and beauty advice, comedy, interviews with celebrities, live gigs from SA's top bands, and the latest from the worlds of blogging, gaming and gadgets. Doctors, opinionated journalists, chefs, sport fanatics, stylists and "techies" form our expert presenter pool. Their informative and witty conversation allowing a casual atmosphere and always errs on the fun side.